In a previous post, I said I was going to write an article just about this tree. Well here it is! In this post, I’m going to tell the history of this tree, show some different angle shots of the tree with a bit of commentary of my thoughts. It’s Christmas eve today in Japan and I thought I’d share this gem of a tree with you all. This special Trident maple is one of my favorite trees here at Aichi-en. Many followers of the blog have asked me about this specific tree because of the unique structure it has. It’s not everyday we see a tree quite like this one so when I first saw it at Aichi-en for the first time I was all over it! 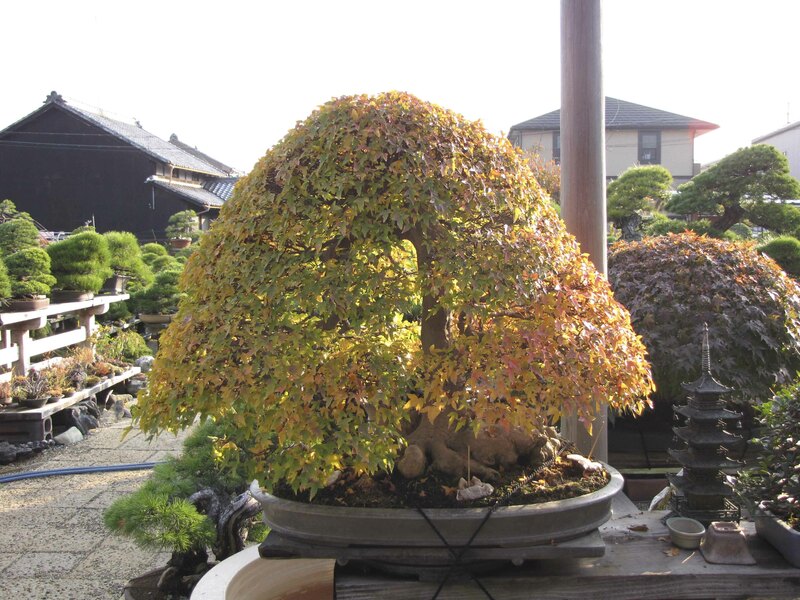 This Trident maple was started by Mr. Tanaka’s great grandfather (first generation and creator of Aichi-en) almost 100 years ago. One of the reason why I like this tree so much is that it’s such a good representation of what Aichi-en is all about. Time and time again when I’m wiring and styling a not so typical tree, Mr. Tanaka will always pushing me to make it more unique and interesting in some way. Whereas most people will either cut or replace something strange, I’m encouraged to keep it. He was taught to do this by his father and his father’s father. This tree has been developed continuously by all generations to this day and has always lived at Aichi-en. When I first arrived here, I asked Mr. Tanaka about this tree and why was it was made this way. The answer wasn’t simple or quick and it was filled with words such as, different, strange, unique, creative, taste and personality. 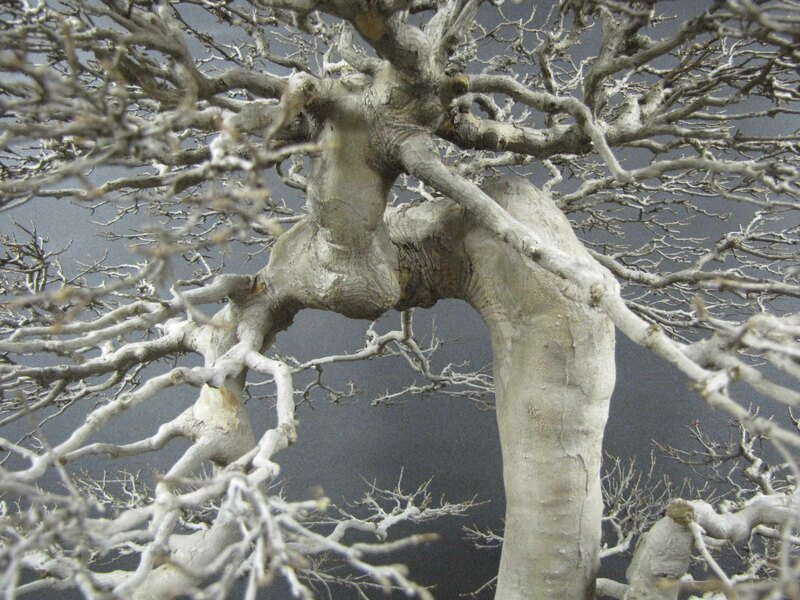 The conversation was one of the defining moments of my apprenticeship and it made me realize that many different factors come to play on how a tree is created and that there isn’t just one way to creating them. After the conversation, Mr. Tanaka then warned me that I should never forget the basics of Bonsai and that, “there is a thin line between a strange tree that expresses good taste and just a strange tree” (the tricky part is finding that line and realizing if I have it in me to create something different then most. Perhaps it requires a certain type of personality? I’ll share more about my thoughts on that in a future post). Let’s get on to the pictures! Here is the tree with it’s leaves removed and pruned for the Winter. The height of the tree minus the pot is 72cm (28in). The width of the tre is 88cm (35in). The depth of the tree is 68cm (27in). 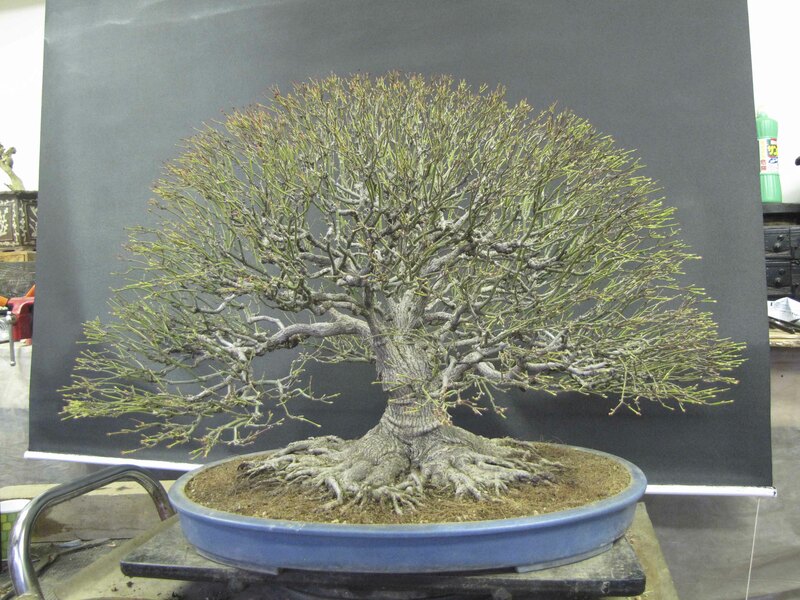 Mr. Tanaka lightly cut back the branch tips to continue the ramification process. Mr. Tanaka likes very ramified trees so he’s always looking for ways to improve the density of a tree. It’s my hope that one day, Mr. Tanaka will trust me to work on this tree. When that day comes, I’ll be sure to share my experience. Here is a shot of the tree from it’s right side. Notice how the apex of the tree is very forward. 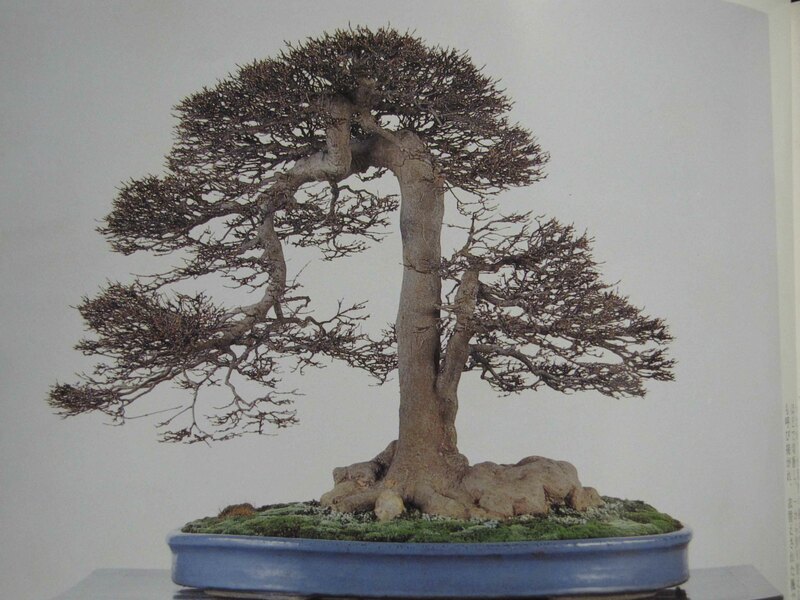 I have found that a more forward apex and denser branch structure is a style characteristic of the Bonsai Professionals of this area. The back of the tree. A shot of the tree’s left side. A shot of the second trunk and the middle of the tree. Would you consider this tree a twin trunk? Serious, because I have no idea what kind style category to put this tree in. This is also a great example of a tree that flows in the oppose direction of the second trunk. Many would consider the second trunk as the key and direction branch. Notice also that as the second trunk gets thicker every year, it starts fusing itself with the main trunk little by little. A shot of the bend in the trunk that makes this tree so strange and interesting. 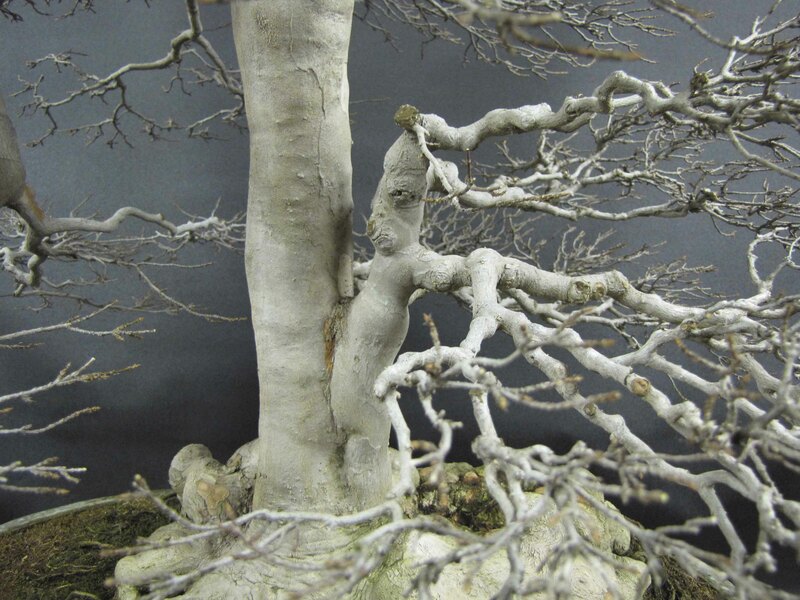 The trunk then splits into the main branch and the apex. 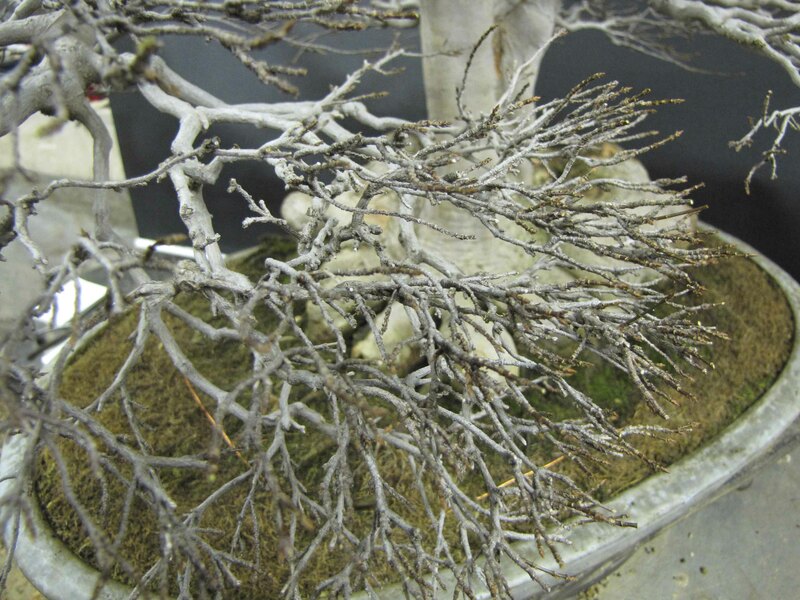 Here’s a closer shot of the ramification of the branches. One thing I noticed about this tree is that the ramified branches are all very skinny. Is this a natural characteristic of this tree or is it the ramification that forces the tree to divide the food among all the branches? Perhaps both? A different angle shot of the structure of the tree. Right now, many of you are probably asking, “how do I get my Trident maple to develop that kind of ramification?” I’ve been learning and working on a lot of maples this season and have been taking lots of pictures. I’ll fill you in on a future post. I promise! In the mean time, take some time to really examine these pictures and jot down what you see and notice about the branch structure and ramification. 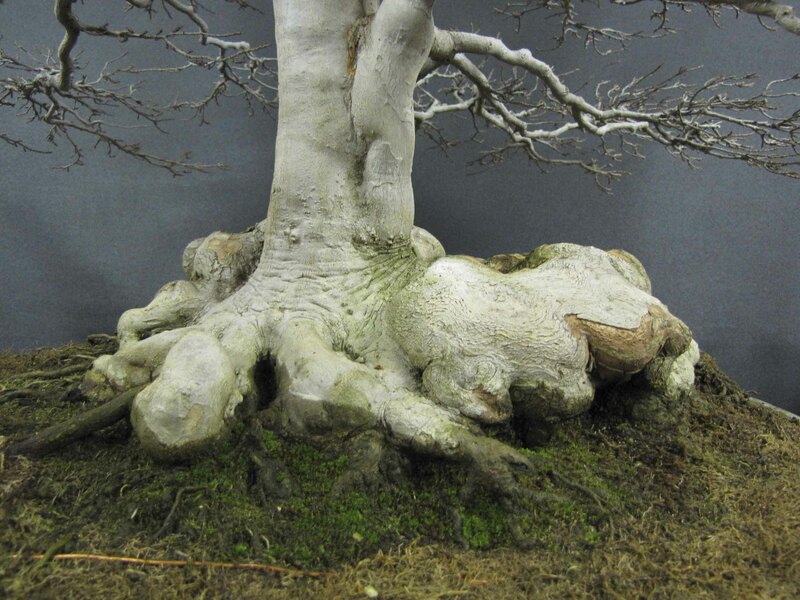 The structure of the branches all fall under the, “basics,” of Bonsai. Then share your thoughts in the comment section below. 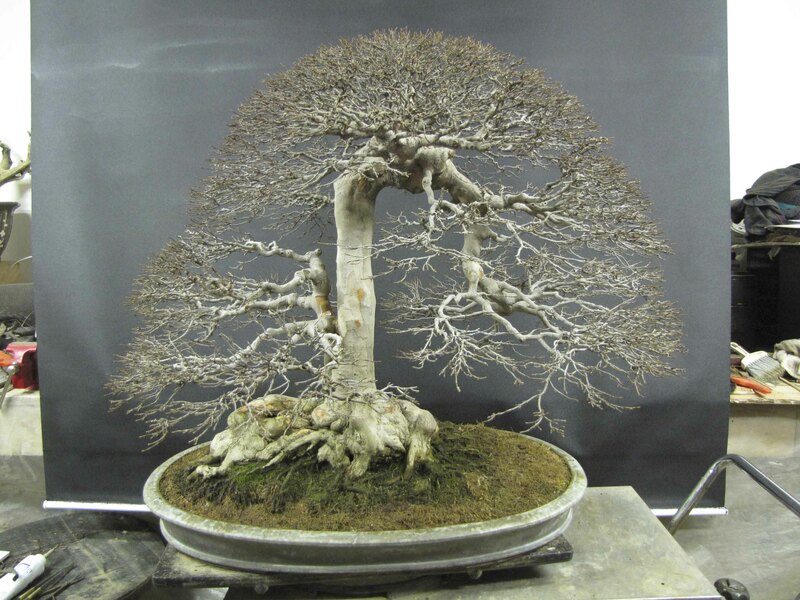 Pictures can teach and answer a lot of our bonsai questions, it all depends on how hard we look. Here is both of them together but 16 years apart. This is the first Christmas I am spending in a different country. I can’t believe that the year is coming to an end already. Two more months and I’ll be finished with my first year as a Bonsai apprenticeship. I feel that I’ve already learned so much and am excited to see what the future brings. Thanks to all of you who have been following my experiences here in Japan and supporting me through my studies here. Through everything I’ve done here so far, I’ve always had a uplifting feeling that I have a great group of people out there rooting for me all the way. Merry Christmas and Happy Holidays to you all! This will probably be my last post of the year. Happy New Years and I’ll see you all in 2012! Great tree! I think that in a country like Japan, where its not uncommon to see excellent maple trees, its good to have something outside of the box like that. 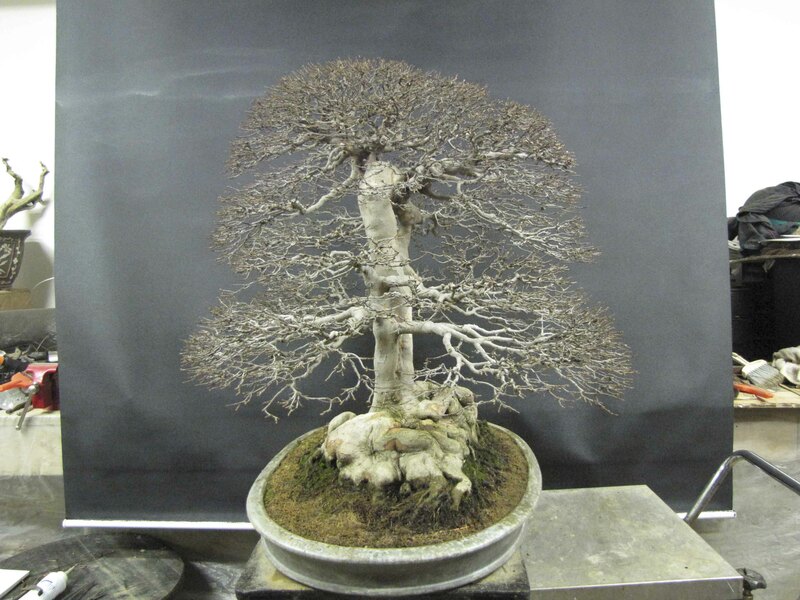 I like the way the nebari extends to the trees right along with the first branch(second trunk)? I also like how the nebari kind of looks like knuckles, but it still seems to flow. There is a lack of taper, but the way there is that jog to the trees left at the top, it would be hard to support the top if the trunk was thinner there. Since the ramification is so superlative, it still gives the same aesthetic feeling of a tapered trunk especialy the way it leans forward. Am I wrong, or do trees like this get picked at the big Japanese shows simply because its obvious that it been cared for so well for so long and that it simply grabs your attention? I’m sure your going to be one of the people that will put California and the USA on top of the Bonsai heap outside of Japan in the next couple of decades!!!! Congradulations on making through your first year. Looking forward to meeting you in person. Peter, I’ve been looking forward to this post for a while now. Thank you so much for taking the time to give the history of the tree and take the detailed pictures. One thing that caught my eye immediately was the picture of the nebari. I noticed there’s a root at the front left side that shoots straight out. It looks like it may have been uncovered recently…but I could be wrong. Do they plan on chopping it, or will it thicken up and develop bends and kinks like the rest of the nebari? Are there techniques for manipulating a straight root like that to develop more interesting character? Very good observation Alex! I believe the root has been there for a long time now and I don’t think Mr. Tanaka is going to change it anytime soon. Perhaps someone in the future will do it. On the other hand, the roots are so strange right now that most might just leave it as is. If anything happens to this tree in the future, I’ll be sure to share it with everyone. Take care and Happy New Years Alex! Peter, you’ve done so much, and shared so much with us, and your first year is not yet complete. Just think what year two will be like! We can’t wait. Also, please extend our appreciation of Mr. Tanaka’s modern thinking on the process of apprenticeship. His ideas on the process are opening up a wealth of information, through you, to the rest of your followers. Have a Happy New Year for 2102, and year 2. I will relay the message to Mr. Tanaka! Thanks again Barry and Happy New Years! 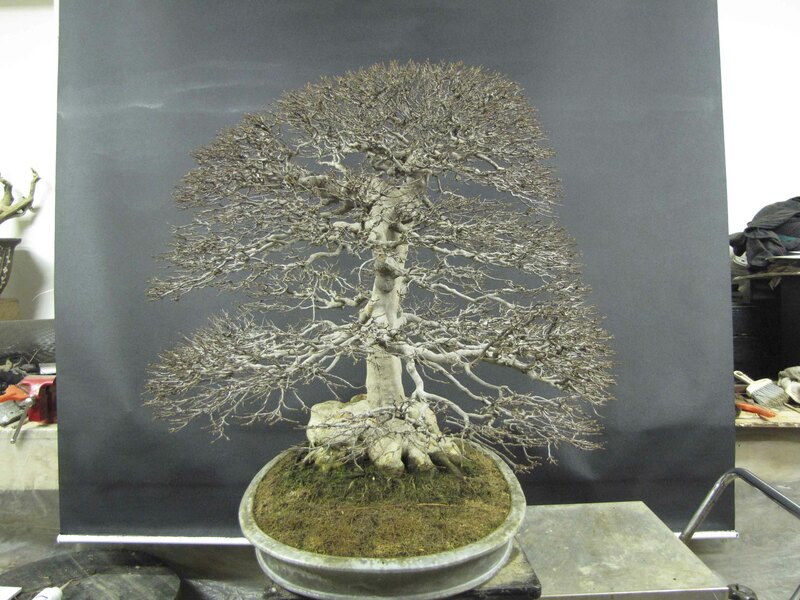 Excelent post and what a unique tree – the bark is very white, (in fact many japanese maples appear very white these days). In the older picture of the tree the bark is more the natural colour – is this because they are spraying the tree with diluted lime sulphar for pest control, or to turn the bark white as well ? Hi Marcus. The trunk is whiter now compared to the photo of it 16 years ago. I think the picture I took is slightly over exposed so the trunk might look whiter then it really is. As tridents get older, they do turn a whitish grey color. We actually sprayed the tree today with lime sulfer but not for the white color but just for pest control. Normally the lime sulfur will wash away during the growing season and all the watering. I do know that sometimes people will paint lime sulfur on the maples so they look older. Most of the time though, I think it makes it looks artificial because it’s a little too white. LOL Good observation Marcus! Happy New Years! Thanks for the very kind words Dominic! 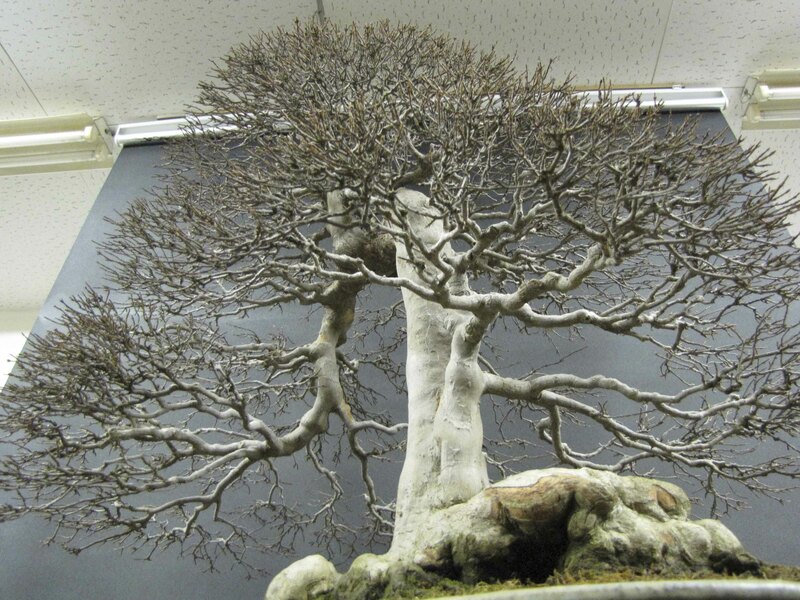 It’s been great that I’ve gotten so much support from Mr. Tanaka in writing and sharing about Bonsai in Japan! Having people such as yourself reading and commenting on the blog is a reward in itself! Take care and Happy New Years! Have a merry christmas and a great new year. You’re well under way with your future. Stay humble and focused, good things will come your way. I will Donald! Happy New Years to you and your family! Happy New Years to you Mark! Merry Christmas from Fresno Ca. I have started reading your Blog and have enjoyed them very much. Look forward to all of the information you have to share. Thats an amazing tree! I love trees with history behind it. Wow, has it already been a year? Thanks again Peter & have a happy new year! Thanks Duane and Happy New Years to you! I too can’t believe it’s almost been a year and I’m looking forward to the future! It was great meeting you at Takamatsu! Take care! Mas Imazumi always said we should learn the rules so we would know how to break them. This tree does break alot of rules. Mas was a very wise man and a huge contributor to what Bonsai has become in Northern California. Happy New Years Penny and I hope to see you in March when I’m home visiting! Great article about an impressive trident! Merry Xmas and a great 2012 Peter! Wish you and everybody there all the best. Happy New Years to you as well David! Take care! Not only are your blogs interesting, but they feature clear, in focus images that go a long way to help communicate your ideas. It is with pleasure that I look forward to reading your future blogs and to live your apprentice life vicariously. Thanks Michael! I can’t wait to see what new things I learn next year! Happy New Years! The level of detail you go into and thoughtful questions you pose really make your blog stand out Peter. It is a real blessing for us all to be able to share your experiences this way. Thank you for this wonderful gift to the development and understanding of bonsai. Wishing you a very Merry Christmas and more great lessons and experiences in 2012! You are very welcome Candace! Happy New Years and take care! Thanks for the time and effort that you have put in to share your experiences with us back home. I’ve learned so much just reading your blog and look forward to when you are back home teaching us your well honed skills. I’m glad that the post have helped you Jeff! I can’t wait to get back home and chat with you in person again! I hope all your family and trees are doing well! Happy New Years! This is one of the most inspiring maples that I know of. I love it. Thank you so much for reading the blog Walter! Take care and Happy New Years! The tree has improved a lot in 16 years. I love the long, thick cascading branch. Thank you Peter for all your wonderful posts this year. I hopefully look forward to seeing more in 2012. Thank you Richard and Happy New Years to you! Take care! Peter, First off Happy New Year to you and all at Aichi-en. 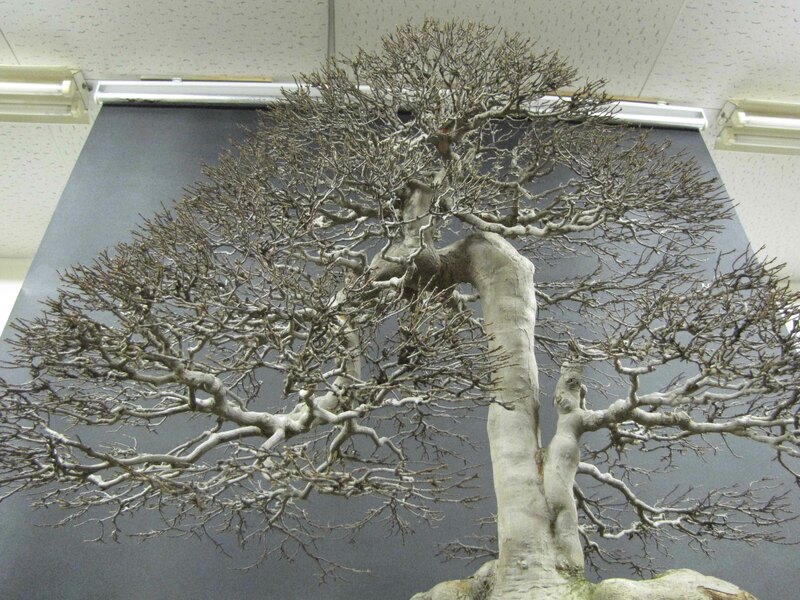 It must be humbling to work with a Bonsai Master at a place where he is the third generation caring for the trees there. The first thing that struck me when I saw the first photo, with the leaves just turning, and before I started scrolling down, is that it is two different trees. Look how the color on the branches from the smaller trunk has advanced beyond the color of the main trunk. Mr. Tanaka’s grandfather must have bound the bases of two different trees together 100 years ago to make a Mother/Daughter design. That’s what I would call it anyway. It would be quite a thrill to be able to walk out in a bonsai display area and examine trees such as this at your leisure. You can learn so much by pondering how the tree has ended up as it has. Something that cannot be done in a public display while passing by in a crowd. I have so enjoyed your posts and your sharing your learning experiences with us. Looking forward to the coming year and your enlightening posts. Happy New Years to you too Frances! Take care! I really love that tree, it’s so unique! Has it every been shown in Sakafu? How do you think the tree would be taken/judged? Thanks! Thanks Jeremiah! I like this tree as well and I’m not sure I’ll ever seen another one like it! The only time it’s been shown was 16 years ago at the Aichi-en family show. It’s never been in competition and I’m not sure how well it would do. 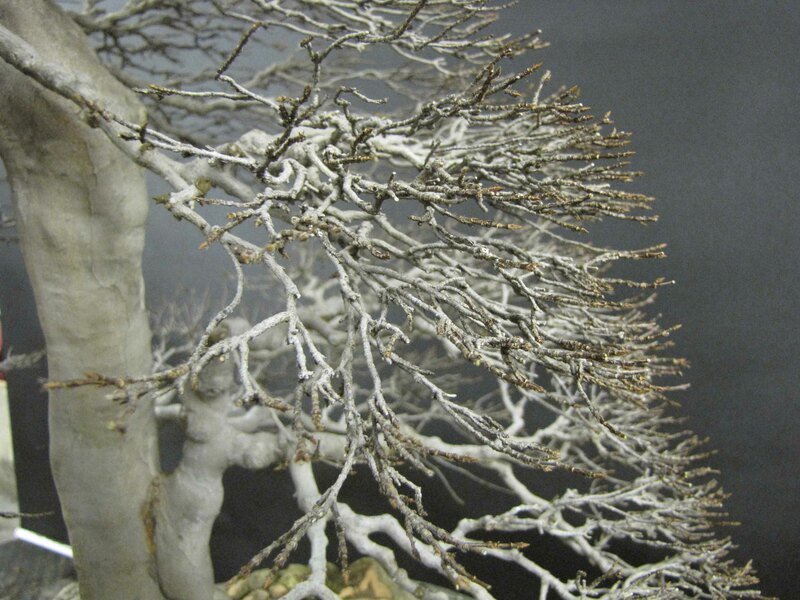 The trend in Japan now is more focused on the more unusual trees so perhaps maybe very well! Maybe I’ll hint to Mr. Tanaka that he should show it! Maybe one day someone will buy it and show it at Kokufu-ten. It would be awesome so see how it does there! Happy New Years my friend! I would think that a tree with such an emotional history would have a Not for Sale tag on it! It’s a realy strange tree, for sure you don’t see another tree like this! Can’t wait to read new coming posts! Merry Christmas Peter and wish you all the best for 2012! Thanks Youri and Happy New Years to you as well! Take care! Thank you very much for your articles and your photos. Your comments are very precise and the emphasized human aspect. It is very enriching for us! Joyeux Noël, bonne année et bonne santé ! Often I do feel that people get so wrapped up in Bonsai rules that they forget that it’s a way for them to express themselves as well. That’s one of the many things I’ve learned through the years and very much so here in Aichi-en. Take care and Happy New Years to you! Merry Christmas Peter! Thanks for all your posts this year, and look forward to seeing what the New Year brings you (and us)! Thanks Brian! I’m excited to see what I learn as well next year! Happy New Years! The tree is indeed interesting to look at it, and as you say it all works. If one wanted to pick on the tree there are many areas that do not follow form, like the trunk not having much taper except for the base. Watching both you and JT work, I’m beginning to realize how to achieve ramification, now whether I can follow will be interesting. 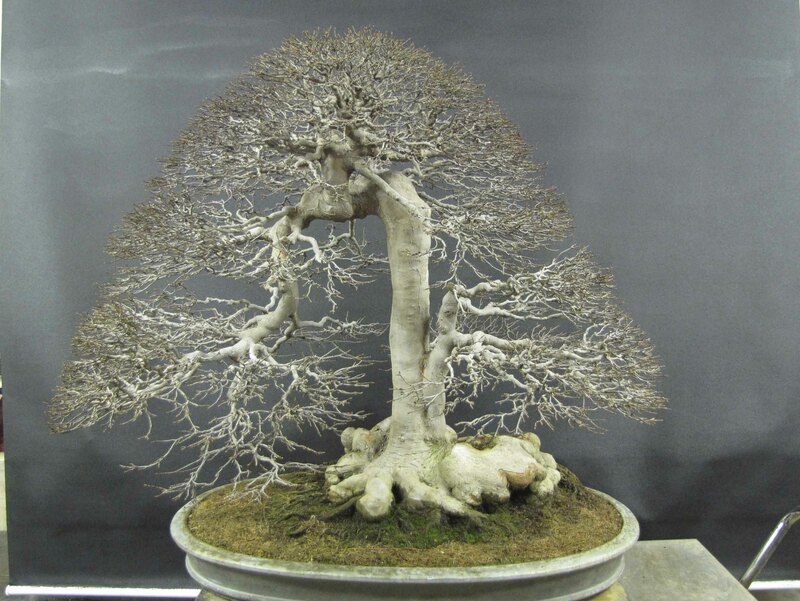 At one point in my bonsai life, trees were always show ready, but that meant there wasn’t much development. Great observation Sandy! People either really like this tree or they don’t. Either way, I love the fact that it makes me stop and think about it for awhile. I’m glad that things are working out well with JT and that you’re continuing to progress in your skill and training! It has been a Holidaze here as well. I’m going to start using that word now! LOL Happy New Years Sandy! I am looking forward to the “how to that ” Post. The Maples look fantastic ! Stay well ! Have a Happy New Year !